102 mm/60 Model 19113 х 1 pcs. 450 mm Twin Model 19135 х 2 pcs. Derzki — Soviet Tier III destroyer. The ship belonged to the first series of Russian destroyers to be equipped with turbines. Derzki boasted good survivability owing to a high speed combined with dimensions that were comparatively large for her time. Until the very end of World War I, she had been unrivaled in terms of the number of torpedoes that could be launched in a broadside salvo. Derzki may feel like a downgrade from Tier II's Storozhevoi. She does have more health, but the ship is bigger and easier to detect and hit, is a bit less maneuverable, and the gun range is slightly reduced. She is, however, still relatively fast, and has the largest torpedo broadside of all Tier III destroyers with 10 torpedoes. 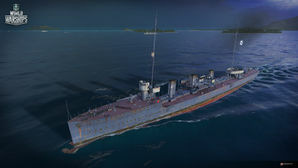 Captains should use her speed to charge enemy battleships, where the sheer mass of torpedoes, combined with the point blank range and sluggish maneuverability of the battleships the Derzki will be matched against guarantee at least few hits and, more often than not, a kill and a "Devastating Strike" medal. However, blindly charging at the closest battleship in range will guarantee a quick trip back to port; captains should seek out a battleship with little to no cruiser cover, activate the Engine Boost ( ) consumable, charge in, launch their torpedoes, deploy smoke, then disengage. If any cruiser or destroyer attempts to pursue you through your smoke, unleash another torpedo broadside once they get close to make them regret continuing pursuit. Large torpedo salvo with fast reload. Worthless AA; inferior to its predecessor. The Derzki — or Bespokoiny — class destroyers were a class of destroyers built for the Imperial Russian Navy just before World War I. Nine ships were built for the Black Sea Fleet. These ships were a derivative of the Russian destroyer Novik, but were slightly smaller. These ships were popular with the Russians and effective particularly in the Black Sea, where the Ottoman Navy had no similar ships. One of the Derzki's historical torpedoes, the Model 1912 (the same ones used on Izyaslav and Svietlana), is missing. It was mounted on all Novik-class destroyers. The actual Model 1910 torpedoes either have a 2.0 km range and 34 knots speed, or 3.0 km range and 29 knots speed (late Model 1910). Derzki had a total of four machine guns. In 1916, the anti-aircraft armament was augmented by two 47 mm/40 Hotchkiss guns. Derzkis of the 1st division in Sevastopol, May 1916. Tsar Nicholas II visiting the destroyer Derzki in Sevastopol, May 1916. Moored alongside her is Bespokoiny. In the background is the repair ship Kronstadt. This page was last modified on 9 May 2018, at 14:06.